It’s now just over a month since I started in my role as a Code for Europe Fellow. As part of Nesta’s Open Data Scotland programme, I’m working with Aberdeen City Council to develop new open source digital services using Open Data. In addition to myself in Aberdeen there are also three other Code for Europe Fellows (Alan Gardner, David Morrison and Rory Gianni) as part of the programme in Scotland. They are working with the local authorities in Edinburgh, East Lothian and Clackmannanshire. Even though each of us are working on our own projects with our respective local authorities, a big part of the programme is the collaboration between us. To help us get to know each other we all attended an introductory get-together at Nesta’s offices in Dundee at the start of May. Not only did we get to meet each other but we also got to meet the excellent team from Nesta who are supporting us throughout the programme. Between us we established our goals for the programme and what would indicate that it had been a success. Sustainability – whatever we develop must not rely on us to support it. Other people must be able to use and expand our creations. Reused globally – other cities around the world should be able to take whatever we develop and use it easily by simply plugging in their own data. Change the way local authorities approach problem solving – demonstrate that taking a lean, agile approach to solving problems can produce results without being tangled up in the red tape traditionally associated with local authorities. People using it – most important of all: what is the point if no one actually wants to use what we build? Shortly after Dundee we attended a Code for Europe workshop in Edinburgh where the Scottish fellows and our local authority representatives met up with our European counterparts from Amsterdam, Helsinki and Berlin. The European projects started before our Scottish ones, so we heard from them about their experiences so far and saw some demos. In return we gave a brief overview of our intended projects. It is the public who are the intended end users of the new digital services that we are creating. This means that service design is a very important part of the process: after all if we rushed ahead and built what is in our heads how do we know this is what people actually want? 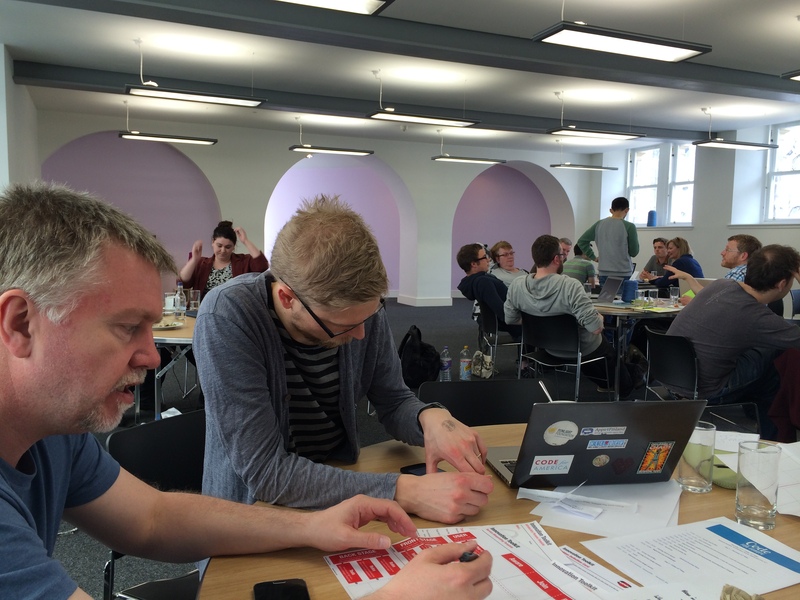 To help us with our service design skills, as part of the Edinburgh workshop, Sean Miller and David Townson, founders of Nonon, delivered a workshop to get us thinking about the individual needs of our users. The next stop on our ‘learning from others’ tour was the Wagg Society in Amsterdam. We heard from the Code for Europe fellows who have been working with Amsterdam City Council since last year and how they planned to continue supporting the local citizens. Bert Spaan, one of the developers behind the CitySDK project, talked about his work and how the CitySDK helped cities present their open data. Following the goal that we learn and improve our skills at each event we had a session on the SCRUM methodology. Waag’s project manager Suzanne Heerschop led the session and talked us through her experiences. 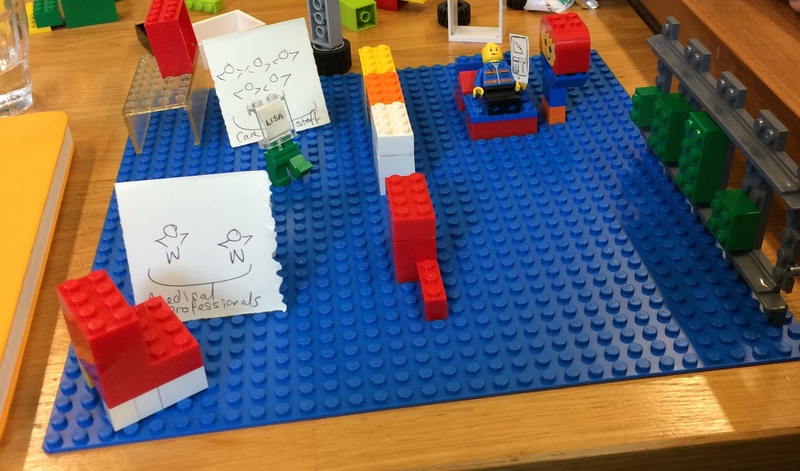 Anything that involves Lego is a good thing in my book and we certainly made good use of those building bricks in demonstrating the advantages of working together and in how to express a problem visually. The first month has been very exciting and been packed with valuable learning experiences that will certainly help the project evolve.